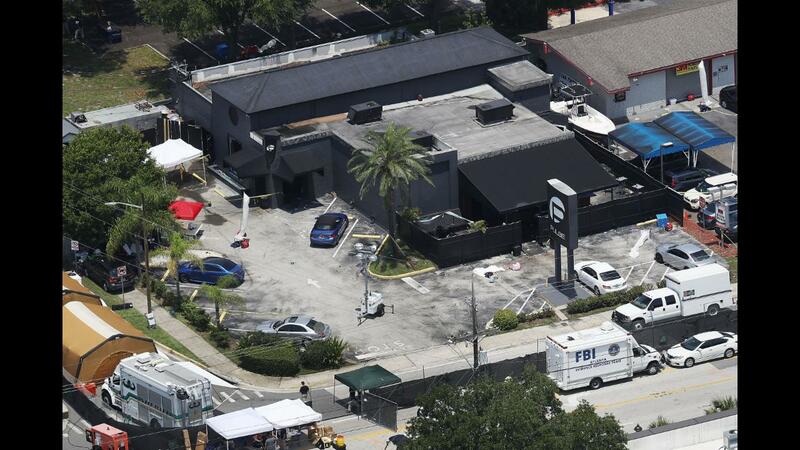 Multiple news outlets reported on Monday that the gunman who carried out the Orlando terrorist attack frequented the LGBTQ nightclub where he killed at least 49 people. He also used multiple gay-dating apps, according to several people who had communicated with him on the apps. And one of his former classmates told The Palm Beach Post that he believed Mateen was gay — something federal investigators are now reportedly looking into — and that Mateen once asked him out romantically. The new developments about 29-year-old Mateen complicate his likely motives and his pledge of allegiance to ISIS — aka the Islamic State, ISIL, or Daesh — the terrorist group that has been known to throw gay people off of rooftops. But ISIS might have a ready-made justification for claiming Mateen as a "soldier of the caliphate" despite the fact that homosexuality goes against the strict interpretation of Islamic Sharia law the group brutally imposes. "IS' murderous hatred for homosexuals is well-known, so it might be expected that if it turns out that Mateen was a homosexual this would put them in something of a bind, but in fact IS has a rather easy theological get-out clause," Kyle Orton, a Middle East analyst and fellow with the Henry Jackson Society, a UK-based foreign-policy think tank, told Business Insider in an email. IS can situate this squarely within their ideological program of repentance and deliverance. When IS has murdered homosexuals within the caliphate, it has distributed media of its fighters hugging the condemned men, the message being: IS bears no personal animus, it is simply enforcing god's will — punishment being a 'corrective' and an act of mercy since it allows atonement. With Mateen, therefore, IS can claim to have wrested him from sin and pulled him into the light. Orton noted that ISIS's "repentance factor" goes back to Abu Musab al-Zarqawi, the founder of Al Qaeda in Iraq, ISIS's predecessor. The Jordan native had "a fondness for alcohol, drugs, and tattoos" and a criminal background before he started the terrorist group that was so bloodthirsty that it was disowned by Al Qaeda, according to Orton. Zarqawi "felt that by correcting his own practice of his religion, and forcibly correcting others, he was doing God's work," Orton said. And Sunni tribes that fought against Al Qaeda in Iraq during the US war there were allowed to "repent" to avoid slaughter when ISIS seized territory in Iraq. The profile of former petty criminal who gets religion, repents his former life, and joins the caliphate is now so common as to be cliché, especially among the Western foreign fighters. IS can easily assimilate a homosexual — regarded by them in any case as something someone does, rather than something someone is — who sees the error of his ways and joins their cause. Thomas Joscelyn, a senior fellow at the Foundation for Defense of Democracies and an expert on terrorist groups, made a similar assessment. He noted that ISIS could possibly hide the news of Mateen patronizing the LGBTQ club and using gay-dating apps from those in its core territory in the Middle East. It still maintains control of the internet in towns it rules. "I don't think it will be a problem in the countries where ISIS mainly operates because the news probably won't get through and ISIS can easily deflect," Joscelyn told Business Insider in an email. "In its propaganda aim at the West, it can also deflect in a number of ways, including saying he redeemed himself from his 'sinful' past." Still, the new information about Mateen — who was married with a child — could complicate ISIS's image as a group of pious ideologues. And Mateen terrorizing a nightclub that he used to frequent suggests underlying motives that have nothing to do with radical Islam. One man told MSNBC that he blocked Mateen on a gay-dating app and described his messages as "creepy." The classmate who told The Palm Beach Post that he thought Mateen was gay also described him as "awkward." "He just wanted to fit in and no one liked him," he told the Post. "He was always socially awkward." Some of the people closest to Mateen have hinted at psychological issues. A woman who was married to him claimed that he abused her, and acquaintances of his remembered him as angry and aggressive. His father has also been criticized for his comments after the shooting, suggesting that it was up to God, not his son, to punish gay people. Experts also have doubts that Mateen was ever in contact with ISIS leadership. Several of the terrorists who carried out the Paris attacks last year and the Brussels attacks earlier this year had trained in Syria and worked with high-level ISIS operatives to formulate their European terrorist cells. Mateen, however, was likely radicalized online, according to US officials. That type of radicalization plays into ISIS's strategy of encouraging supporters in the West to carry out attacks inspired by the group's messaging. But it also carries the risk of claiming attacks before the group knows many details about the people who carried them out. "I don't find it surprising that Mateen may have been gay," Joscelyn said. "If true, I think it does complicate the Islamic State's claim. The organization openly flaunts its hatred for homosexuals." Even so, Joscelyn said that he "wouldn't be shocked if Mateen was both sexually repressed and attracted to jihadi ideas." "Humans, even those attracted to jihadism, are filled with logical contradictions," he said. "There are multiple possibilities here."